Purpose: To demonstrate how using the Wavelight Contoura measured astigmatism and axis eliminates corneal astigmatism and creates uniformly shaped corneas. Patients and methods: A retrospective analysis was conducted of the first 50 eyes to have bilateral full WaveLight® Contoura LASIK correction of measured astigmatism and axis (vs conventional manifest refraction), using the Layer Yolked Reduction of Astigmatism Protocol in all cases. All patients had astigmatism corrected, and had at least 1 week of follow-up. Accuracy to desired refractive goal was assessed by postoperative refraction, aberration reduction via calculation of polynomials, and postoperative visions were analyzed as a secondary goal. Results: The average difference of astigmatic power from manifest to measured was 0.5462D (with a range of 0–1.69D), and the average difference of axis was 14.94° (with a range of 0°–89°). Forty-seven of 50 eyes had a goal of plano, 3 had a monovision goal. Astigmatism was fully eliminated from all but 2 eyes, and 1 eye had regression with astigmatism. 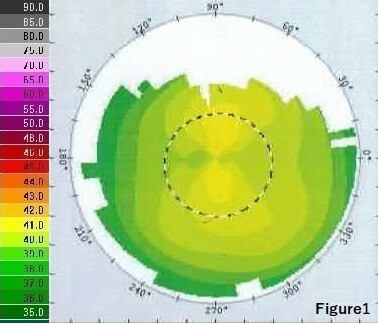 Of the eyes with plano as the goal, 80.85% were 20/15 or better, and 100% were 20/20 or better. Polynomial analysis postoperatively showed that at 6.5 mm, the average C3 was reduced by 86.5% and the average C5 by 85.14%. Conclusions: Using WaveLight® Contoura measured astigmatism and axis removes higher order aberrations and allows for the creation of a more uniform cornea with accurate removal of astigmatism, and reduction of aberration polynomials. WaveLight® Contoura successfully links the refractive correction layer and aberration repair layer using the Layer Yolked Reduction of Astigmatism Protocol to demonstrate how aberration removal can affect refractive correction.